Sutcliffe Jugend’s latest release ‘With Extreme Prejudice’ is out on CD format at Cold Spring Records. 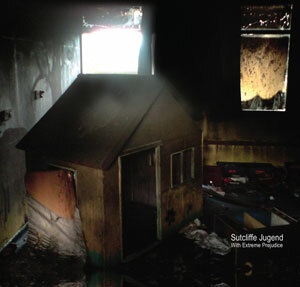 Harsh extreme electronic pioneers Sutcliffe Jugend return with an album of all new material. Three years in the making, and with numerous reworkings, “With Extreme Prejudice” finds Sutcliffe Jugend at the top of their game. Forcing the listener to question their own prejudices and taboos, as modern man struggles to confront and control his inner demons. Musically and lyrically this is SJ’s most varied album to date, ranging from harsh electronic onslaughts to a new kind of musical oblivion. Production and sound values are closer to industrial music than ever before, creating a very different feel to their previous filthwork “Pigdaddy”. Enter if you dare, the very twisted and real world of Sutcliffe Jugend as they execute With Extreme Prejudice. 6-panel digipak.